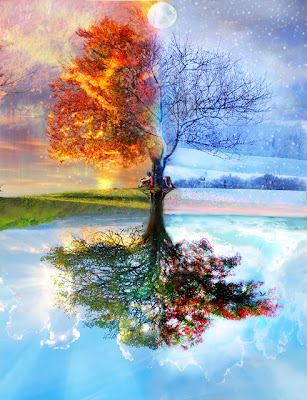 Living in Southern California we have a much less of change of seasons than our ancestors. Pagans from the earliest times have celebrated the changes of the seasons from the new year to the new harvest to the frost. We also celebrate the sabbats and create a celebration to honor the changes, but how can we increase our ability to be in the flow of the earth’s cycle? Starhawk talks about the 9 ways of observing in her book The Earth Path. She was inspired by the permaculture movement in particular Bill Mollison who refers to permaculture as “ a philosophy of working with, rather than against nature; of protracted & thoughtful observation rather than protracted & thoughtless labour; of looking at plants & animals in all their functions, rather than treating any area as a single-product system.” Permaculture lends itself well to the all encompassing earth tenets of the pagan traditions. They both in turn can inspire us to simply take notice and live within instead on top of our environment. 1. I wonder – What makes the sky bluer today than it was yesterday? Why was it cloudy tonight? Why does the moss grow on that side of the tree? 2. Observing Energy – What creates energy? Where is it coming from? 3. Observing Flow – Where does our water come from? Where does it end up? 5. Observing Patterns – From the spider webs to the tree branches to the bark on the trees, how do these patterns interact with each other in our environment? 6. Observing Edges – Where do things end? Where do they begin? 7. Observing Limits - Is there something lacking? Where is the end? Is it then end of our yard? Is it the park nearby? Where the limits in our personal environment. 8. Observing from Stillness - Sit still and see what you can observe. What can you hear? What is right in front of you that you never noticed? 9. Observing Past & Future – How did the trees look 6 months ago? How do they look today and what will they look like 6 months from now? If we all take the time, even if it’s one observation a day or all 9 once a week to really focus on what is going on in nature or even in our own homes, we will become more a part of our environment and in tune with the changes that are going on with our own seasons.